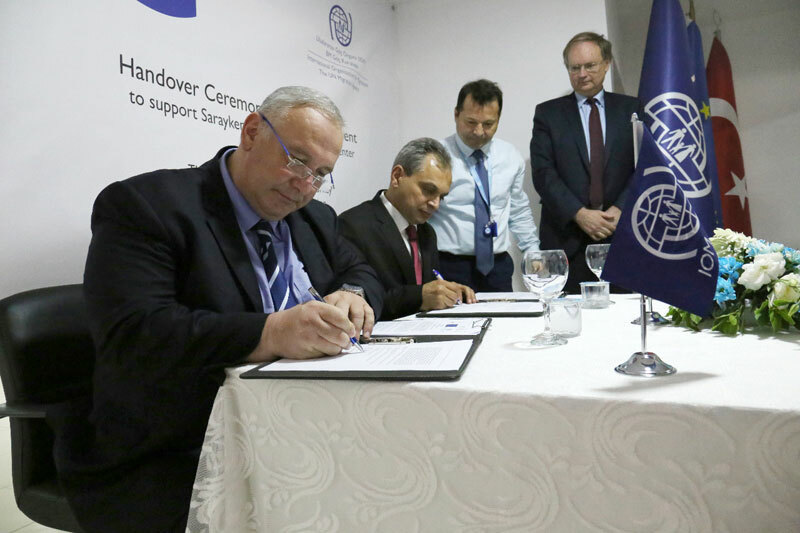 Turkey - Today (06/06), the UN Migration Agency (IOM) handed over medical equipment worth nearly a quarter of a million Euro to Turkey’s Saraykent Migrant Health Training Centre to provide medical services to approximately 5,600 migrants and refugees each month in Hatay province, on the Turkish-Syrian border. The equipment was funded by the European Union (EU). Approximately, 380,000 Syrians live in Hatay province in a country hosting over 3.2 million people seeking protection. Under the Temporary Protection Regulation, Turkey offers the right to access basic services, such as health and education for Syrians registered under temporary protection. However, some Syrians continue to face challenges that affect access to services, including the language barrier, geographical distance, and lack of awareness. The Saraykent Migrant Health Training Centre aims to overcome these barriers by providing free medical services to migrants and refugees in Arabic. The handover of this medical equipment is one part of the EUR 6.7 million Enhancing Access to Services, Strengthening Resilience of Host Communities and Facilitating Integration of Refugees project to complement the Turkish government’s efforts to provide essential services to migrants and refugees. In addition to providing medical equipment, the project also runs two community centres and one medical clinical reaching both the host community and the Syrian population. Services provided under the project include educational programmes, legal counselling, psychosocial support, vocational training, community outreach and conflict management activities for the migrant and refugee populations in these communities. Since July 2015, over 150,000 Syrians and local community members have accessed the services. "EU is committed to support the health sector in Turkey in all possible ways and through all EU financial instruments," said Christian Berger, Ambassador of the EU to Turkey. "In addition to our EUR 300 million grant to the Ministry of Health, we have also been funding IOM to increase access to a wide range of services for refugees and host communities, including health services. This medical equipment procured under the IOM-implemented project will be used to train doctors and nurses in this very same Migrant Health Training Centre and will then be used, after the training courses are completed, to provide health care to Syrians in a Migrant Health Centre Unit in Antakya," noted Ambassador Berger.